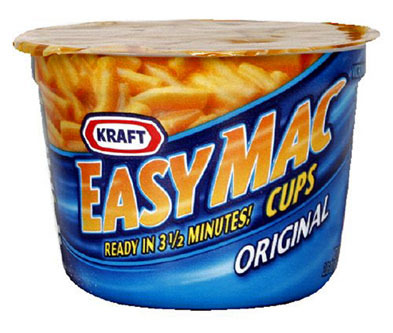 Kraft Easy Mac Cups are a quick, convenient way to warm any appetite. Easy Mac Cups are perfect for any need-to-eat-now occasion. Just add water and put it in the microwave! Remove lid and cheese sauce mix; set aside. Add water to fill line. Microwave uncovered on high for 3.5 minutes or until macaroni is tender. Do not drain. Stir in cheese mix until well blended. Cheese sauce will thicken upon standing.